Euan Armstrong is British, 74 years old and lives on the Costa del Sol. After living here for many years he says his only link he has with Britain is his passport. Mr Armstrong is about to lose his home, a house in which he invested his life savings when he first moved to Spain. He has had to go back to work to try and pay off his debts which have resulted from a fraud into which he, and around 800 people across Spain were drawn, it is called a Foreign Reverse Mortgage, a product that has nothing to do with the Reverse Mortgages available in Spain (hipoteca inversa). 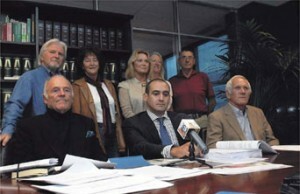 «The Foreign Reverse Mortgage had a speculative element, it invited foreign pensioners to defraud the Tax Office.” explains Antonio Flores, a solicitor from Lawbird Legal Services who is representing 20 cases on the Costa del Sol. The scam was headed by foreign banks and financial advisors, the majority of them Danish, who had been working in Spain for several years, many of them, according to Flores, without authorisation of the CNMV (National Market Securities Commission). Their objective was to raise large amount s of money which was then invested in tax free havens like Luxembourg and the Channel Islands. The victims were established retired foreigners from the Costa del Sol to the Costa Blanca and in the Balearic and Canary Islands who were offered the possibility of a mortgage for more than the value of their home. The money would then be invested outside Spain, preferably Luxembourg, and they could live off the comfortable cushion that that would provide. ”The victims were sent leaflets saying: that the Spanish Tax office charged abusive amounts of tax and warning of the high inheritance tax, of 70 – 80 per cent that would be due on their properties if they did not have a mortgage, said Flores. It is estimated that between 2004 and 2009 about 800 contracts were signed in Spain, with a Spanish notary. According to Antonio Flores, the money was invested in stocks and shares which in a very short time started to lose money. In Euan Armstrong’s case his house was valued at one million euros and he has lost 80 per cent. Ian Sherdley who was also affected by the scam, has lost two of the four million euros which his house was valued at. The solicitors acting for the affected home owners have said that it is very worrying that the banks and financial companies involved tried to defend the tax fraud by issuing “specific guides on how retired foreigners could increase their wealth in Spain”. Nearly all the financial agents involved in the fraud have already left the country. This entry was posted in In the Media and tagged Antonio Flores, Lawbird on November 11, 2011 by admin.